From the always delicious, always reliable Kalyn’s Kitchen. I added some grilled chicken to this, for a complete meal. Very colorful, too. Preheat oven to 425F. Put chopped cauliflower and peppers into a plastic bowl and toss with 2 T olive oil, stirring so the vegetables are all lightly coated with oil. Season to taste with salt and fresh ground black pepper and stir again. Spread the vegetables out in a single layer on a cookie sheet and roast for 20 minutes. 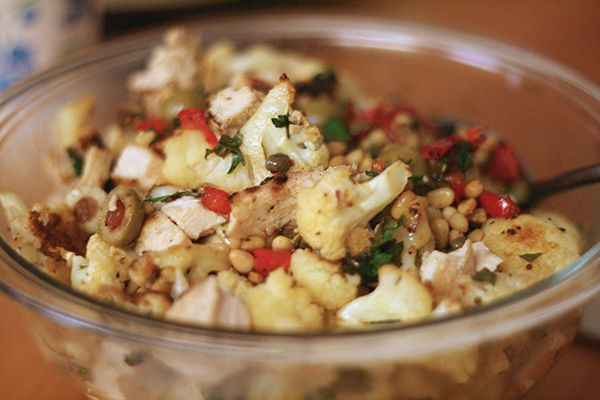 While the cauliflower and peppers are roasting, slice the olives and measure out the pine nuts and capers. Chop the parsley if using. 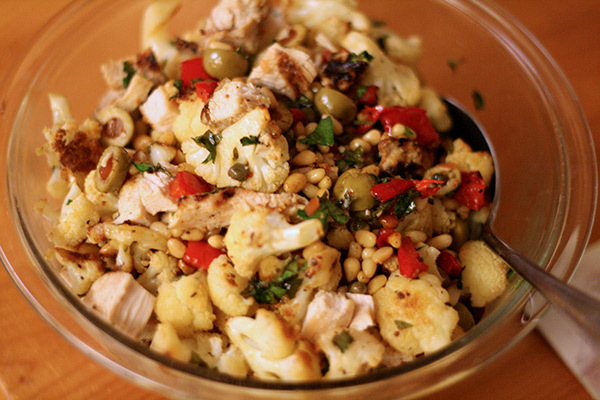 After 20 minutes, remove cookie sheet from the oven, put the cauliflower and peppers back into the same bowl, and toss with the olives, pine nuts, capers, and parsley (if using.) Spread the mixture on to the cookie sheet again and roast an additional 10-15 minutes, or until the vegetables are starting to brown and the olive pieces are looking slightly cooked. Removed from oven, place in bowl and toss with chicken. Serve hot, with a slice of lemon to squeeze over if desired. Beautiful! I bookmarked this on Kalyn’s blog when she posted it. It really is SO festive! I love this recipe! looks so delicious. This looks good. I regularly do cauliflower or broccoli with red pepper but fried rather than baked – yours sounds a really nice and easier variation as you don’t have to pre-cook the cauliflower. Any time you can use cauliflower I am happy. Very beautiful dish. Don’t know any other way to contact you, so I thought I’d leave a comment here. Just wanted you to know that I miss this blog very much. I know it’s been more than half a year since you’ve had a new entry, but I hope you will consider starting to post again.